Two years ago, finally we visited Siem Reap, Cambodia. The Ankor Wat temples with gigantic stone edifices and intricate temple carvings left us spellbound! But, it was the hustle bustle of tourists and locals, mingling in the marketplace, after dusk, that painted another picture. 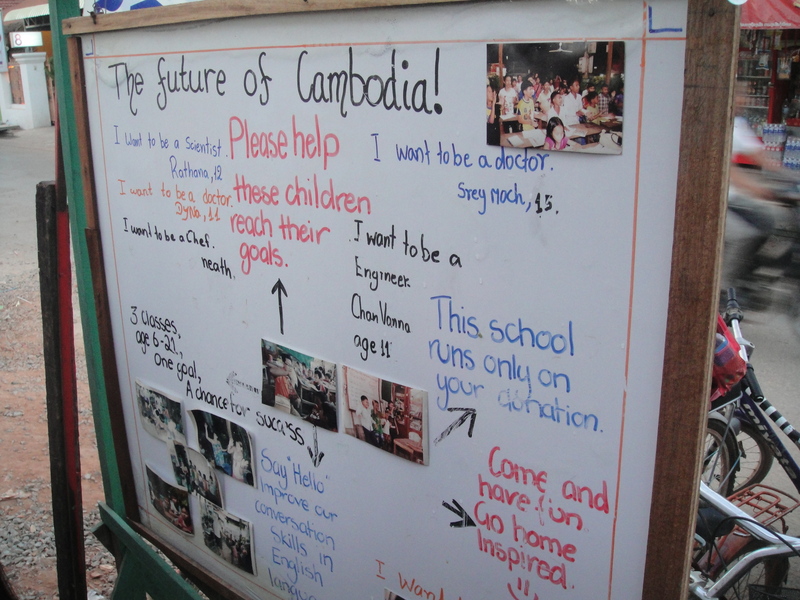 Of ‘real’ stories of Cambodian life. It was the hope, struggle and cultural revival of Cambodians determined to rise back from the ruins…that left a mark in our hearts. ‘Let me take you to the Old Market, Phsar Chas’ suggested our Tuk-tuk driver, on return from Banteay Sri complex. ‘You can get a good, cheap massage for your tired legs’ he added. Phsar means market, in Khmer. Sounded similar to bazar, isnt’ it? As Cambodian empire spread over South East Asia, trade and cultural ties with its neighbours influenced its language, food and traditions. Phsar, generally a semi covered market area, was a traditional shopping place for women. Wicker baskets in hand, Krama, a Khmer chequered scarf bundled on their head or tied around the waist, they set off on a market spree. Psar Chas, Old Market, is located between the Sivutha Boulevard and Pokhomber Avenue, next to the main river. It is open from dawn to dusk. The river end catered to the tourist selling mostly souvenir and craft items. It had a quiet, subdued atmosphere. Soft spoken women pleading tourists to buy. Ankle length sarong, modest hairdo, eating street food in plastic containers provided a peek into life. The other side catered to locals. What a dramatic difference! Early morning electric atmosphere, haggling of prices, butchering fish, squids or meat and towing vegetable laden push carts would drown any visitor. Strange looking spiky dragon fruit, giant jackfruit, plump fleshy lychee fight for space between fried Tarantulas, frog legs in vinegar and snails in large basins. Ah! stalls laden with fresh condiments and spices, essentials of Khmer food were probably an Indian influence. Pubs and hotels, dotted the area. Homes, once to nobles and officials, changed to cheap accomodation for the tourists. Tourism is key to economic growth. Alighting from the Tuk-tuk, I took a moment to admire the historic building painted in white. Decorated with lattice windows and high archway, it was a blend of French and Siamese architecture. Souvenir shops crammed into every inch of space. Silk cloth, paper lamps and scarves in bright colours: indigo,magenta, emerald-green and sun yellow. Little silver trinkets jingled and shined. Inexpensive jewellery and fake ruby stone hair pins, modelled after those worn by queens and apsaras dazzled in the pale light. Paintings on rice paper showed smiling faces of Avalokiteshwara and king SuryaVarman. Today, many workshops and craft schools run by NGO’s and organisations help lift the people, revive Art. Young and old mothers, and children seemed part of the market community. Like in a ‘kampung’ , they shared daily stories. The market provided a perfect learning space for children, after school, to practice scant knowledge of English or maybe earn a little pocket-money. ‘Would you like paper lanterns? suggested a lady. Another rose from her stool, putting away her knitting yarn to show me Cambodian styled embroidered handbags with wooden handles. A girl, with a gentle smile, took my finger, leading me to her mother’s shop. Who said a market tells no stories ? Just need an observant eye! ‘Our richness lies in our culture, not in money’ she smiled. Masks, waist bands, hair pins and variety of Cambodian cultural souvenirs make Phasr Chas a ‘must’ on the tourist itinerary. Conversing with a part-time teacher, who comes every weekend to shop for groceries and rice gave me a deeper understanding of cultural philosophy. She manages her friend’s shop, allowing her precious time to complete household chores. Time was up. This was my bounty: red skin bananas, dry jack fruit chips, brown rice and… a local delight. Palm sugar candy wrapped in dry palm leaves that dot the countryside and need laborious preparation. Need to fill your grocery basket? The teacher guided me to the neighbouring street. Was there more to discover? 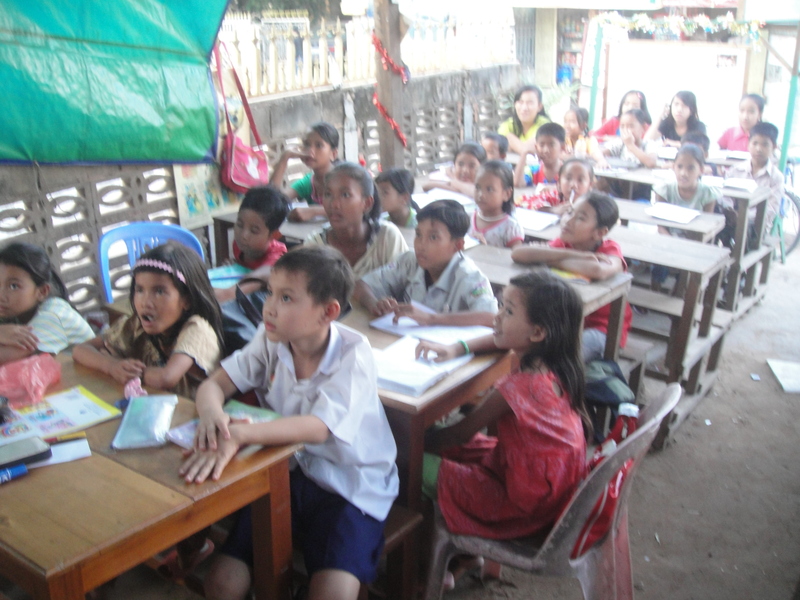 Evening classes for young children were being conducted by local and foreign volunteers. They bring English books, maps and puzzles to engage young minds, breathing better life and ambience into their suvival. A healthy way of keeping them away from drugs and street fights and crowded tourist markets. Just so much behind those smiling Cambodian faces! What did you like about this narrative? Do you have a story about your travel to Siem Reap?